Environmental charity Surfers Against Sewage is calling on the Chancellor Philip Hammond to tackle the creation and use of avoidable single-use plastic in his forthcoming Autumn Budget on Monday, including the introduction of a plastic tax and support for a world class inclusive Deposit Return Scheme for all drinks bottles. A worldclass Deposit Return Scheme would result in almost a 100% recycling rate of plastic bottles – trapping these ocean pollutants in a circular economy instead of on our beaches. Photo: Ian Lean. 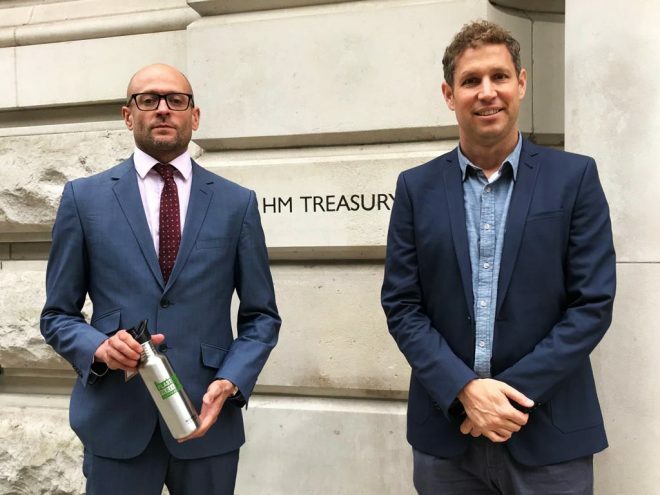 Hugo Tagholm, CEO (left) and Ben Hewitt, Director of Projects and Campaigns (right) at a recent Surfers Against Sewage visit to the Treasury. Eliminating society’s plastic footprint and creating a truly circular economy will require bold and brilliant policies, innovation and sustainable alternatives. Plastic production is set to quadruple by 2050, fuelled by new fossil fuel exploration such as fracking. The government must act with urgency to ensure that manufacturers are truly responsible for the full life-cycle of all of the plastic they produce. 100% recyclable should equate to 100% recycled. The organisation campaigned successfully for the introduction of the 5p plastic bag charge, which has already reduced the circulation of plastic bags by 9 billion. 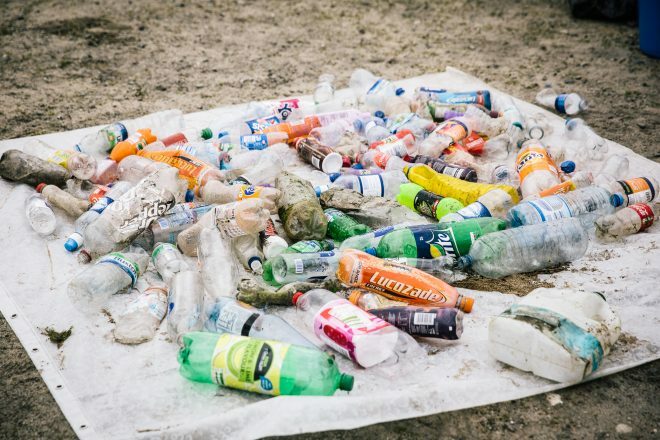 It recently delivered a petition representing the voices of over 325,000 citizens to the Prime Minister, calling for the introduction of a comprehensive deposit return system (DRS) on plastic beverage bottle and containers. A DRS is a proven mechanism to trap plastic in the recycling economy rather than on our beaches and in the wider environment. The government will soon be consulting on the design of the English DRS system; SAS will be calling for it to be fully inclusive of beverage bottle sizes and materials to create a truly world-class and effective system that will protect the environment, create jobs, reduce carbon emissions and prevent littering. Earlier this year, Surfers Against Sewage, alongside 27 major environmental organisations, issued a joint response to the Treasury’s single-use plastic consultation. The group called for a plastics tax to incentivise use of recycled plastics, reduce volumes of the most environmentally-damaging and non-recyclable plastics and polymers, and to extend producer responsibility so that producers and retailers are accountable for the full ‘end of life’ costs of the single use plastics they put on the market. 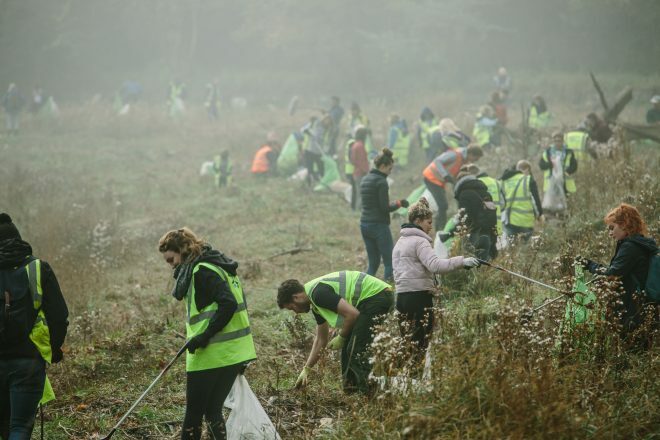 Just this week alone more than 15,000 volunteers are taking part in more than 460 Surfers Against Sewage beach and river cleans personally picking up plastic pollution. 28% more cleans this year than last Autumn. There are more than 400 Plastic Free Communities working together to free where they live from throwaway single-use – from Plymouth to Portrush, Hackney to the Hebrides. MPs across all parties strongly backed the move to a Plastic Free Parliament launched this year. Volunteers taking part in the SAS Autumn River clean at Bristol Gorge. Photo: Alex Casado. It is now time for the Chancellor to act and show that he is part of this growing UK wide movement. Communities across the UK are doing what they can to tackle our addiction to throwaway single-use plastic, but we need urgent and bold action from the Chancellor now to change the system that produces it.